The sweets are getting through! Sergeant Taz Taylor, on attachment to 34 Field Hospital (34 Fd Hosp), writes about his role on Operation HERRICK 12. We are always on the go. We even read emails standing up! My name is Taz Taylor. I have been assigned to 34 Field Hospital since December 2008 and I am currently deployed on Operation HERRICK 12 for a six-month tour. I’m employed in the Medical and Dental Servicing Section (MDSS) and we have a total of three technicians who have been brought together in order to deliver the required equipment support. One of my colleagues is an RAF MDSS technician, and also working along side us is an American Biomedical Equipment Technician. 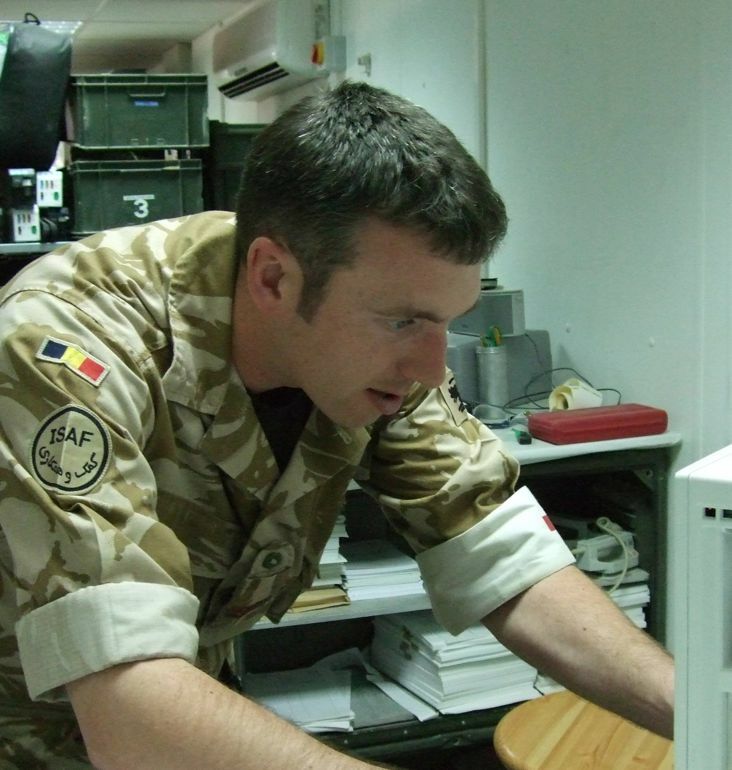 Our main job is the maintenance of over 2500 electro-medical equipment items held by the UK troops in Afghanistan. We have all been out here for just over a month and are fully acclimatised and getting in to the swing of things. Work at the moment is routine servicing, but we have had the odd ‘tricky’ fault to contend with. 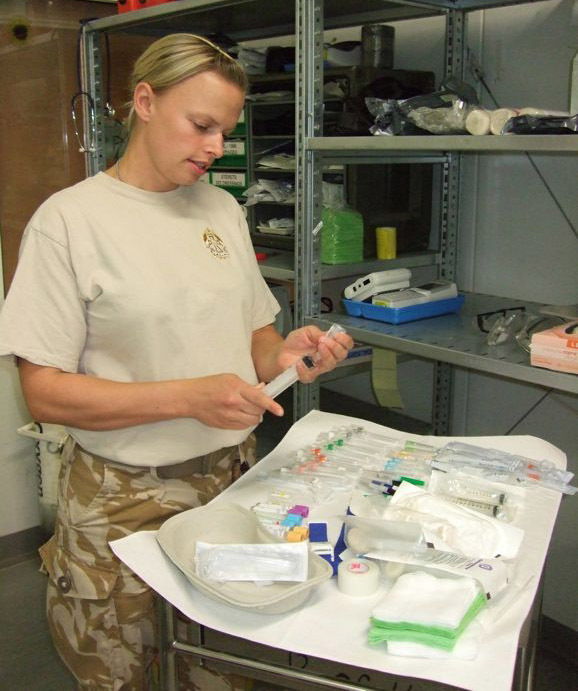 Corporal Claire Moses of 34 Field Hospital (34 Fd Hosp) writes about her week at Bastion Hospital. Day 35 in Camp Bastion. Only 840 hours or 50,400 minutes since arriving, but the big question is how long do we have left? Nobody has worked it out yet. Highlight of the week: Receiving 8 parcels in one day (Thanks to my Moomin, Margarita Prakatan and Winnie). So what’s been happening this week? Well, The A Team is still going strong, however rumour has it that we’re losing our American colleagues who are off to pastures new. They will be missed and Matt (our eye candy for the tour) has promised a picture in hot pants for the girls before he departs. It gets busier every day on the ward especially now that Evans has found her audit file! We are faced with new challenges every day. We had our first birthday on tour this week. Unfortunately it was mine and I am starting to feel my age. But who says you can’t make the most of it on tour? We celebrated by getting up, having a shower, a deluxe meal in the cookhouse, off to work for a 12 hour nightshift and a piece of cake! Thanks to all the guys and girls on the team for making it so special. I can’t contain myself that our t-shirt design for the tour is nearly completed. I should have it by end of the tour! 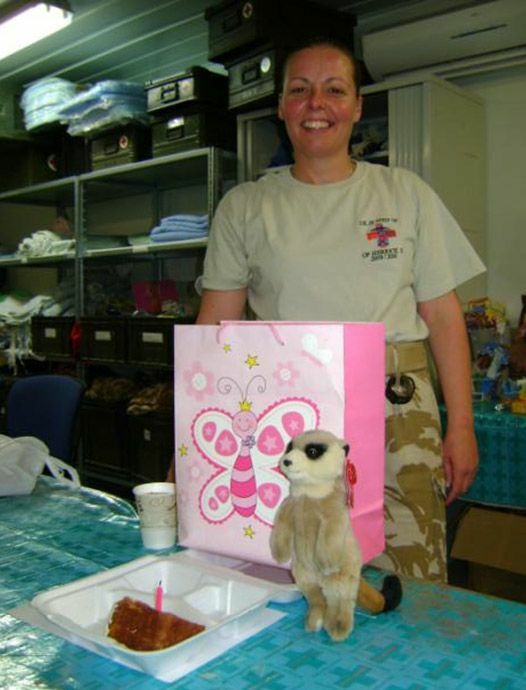 Corporal Claire Moses of the Queen Alexandra’s Royal Army Nursing Corps, currently attached to 34 Field Hospital (34 Fd Hosp) writes about language and cultural difficulties working in a field hospital in Afghanistan. My friends know me as “Military Mary” because I transferred into the Queen Alexandra’s Royal Army Nursing Corps to be a registered nurse in 2005, originally joining the Army as a military policewoman. My parent unit in the UK is MDHU (Northallerton) where I work on a busy medical assessment unit. Out here in Afghanistan I am employed on the intermediate care ward, with a secondary role as an aphaeresis (pathology) nurse. So, day 26 in the “big brother house” which is the wards of Camp Bastion. The handover is now well and truly over and we finally know what’s in the hundreds of containers stacked all over camp. The multinational tri-service team seems to be working very well, which is a good thing seeing as though no one knew each other before we deployed. The workload is high but sporadic. Things seem, to be running very smoothly at present and I am confident it will remain that way. Patient care has been challenging at times, particularly with regards to differing cultures, customs and language, but we’re managing to admit and discharge people in a timely manner. The most common topic is how the NHS doesn’t prepare you for this environment; it’s unique and challenging to say the least. Not even an enormous sand storm could stop us treating people, but after all the motto is “Join the Army. Be the best”. The numerous dubious moustaches and beards are increasing on a daily basis. Should we have a sweepstake or will we save that for the World Cup? I haven’t heard any complaints or grumbles from the staff (or at least none that I can put in this blog)! What more could we want, apart from effective air conditioning and a swimming pool! Life just doesn’t get better than this. Corporal Caroline Storm, from 34 Field Hospital (34 Fd Hosp), has returned to work in Bastion and explains her role on Operation HERRICK 12. Hello. Let me introduce myself formally as Corporal Caroline Storm. Everyone knows me as Storm or Stormy (like the weather). I’m here in Afghanistan for round two, as I deployed here back in 2006 on Operation HERRICK 4. Things have altered significantly since then! The Role 3 Hospital has been transformed from a tented camp to a fully-functioning medical treatment facility, providing assessment, stabilisation and aeromedical evacuation back to the UK. As a registered nurse in the Queen Alexandra’s Royal Army Nursing Corps I am very proud to contribute to this multinational mission in support of the Afghan government and the people in order to facilitate a stable and peaceful country. Back in the UK I am part of 3 Medical Regiment, where we are tasked to provide medical support to military exercises and on deployed operations. I am currently working in the Emergency Department (ED) in the Bastion Hospital and it is certainly a dynamic and rewarding working environment. We see everything from minor ailments to major combat trauma. It is truly unique, and with our US Navy contingent we operate like a well-oiled machine and are so proud to be part of it. Do read my blog in the coming weeks to see what happens during my time in Afghanistan.